The cold brings ease. On skis I cross quickly over river ice, back and forth, gliding bank to bank, instead of going by trail through the woods to cross at the trestle. 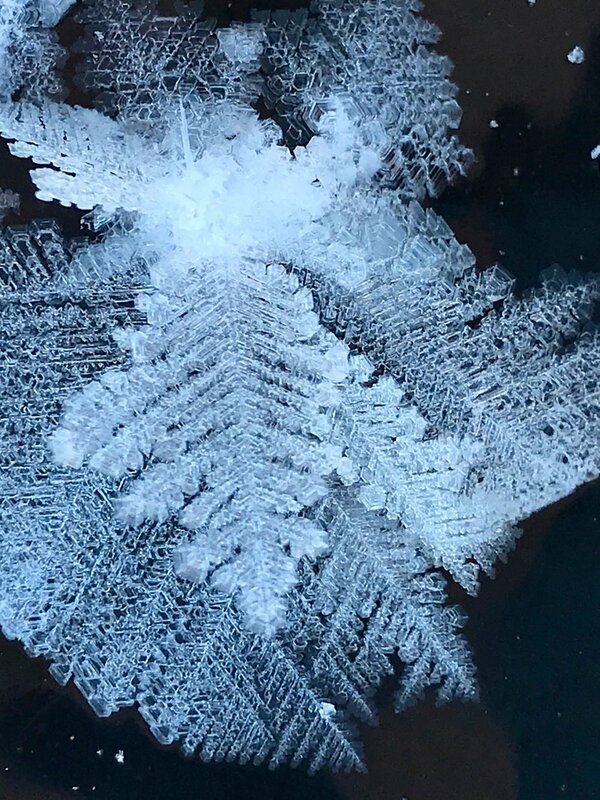 In a pocket of frozen paw print on the surface of icy river, I find these beautiful branch like crystals formed overnight. How lonely winter woods would be without my hearty, happy dogs. In minutes we cross and ski a Charles link trail it takes us a half hour to reach by land. The daily collages I've been making for over a week continue to inspire me, effortlessly. I woke with the first line of a poem, groggy, and grateful, sat up and wrote a draft quickly, a poem about dancing, dizziness, and drinking too much. Then, out into the fresh.